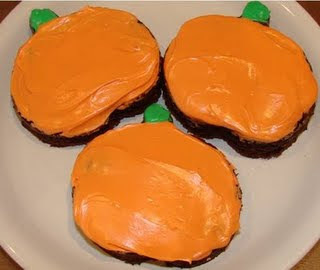 This week I saw a really cute recipe for Pumpkin colored brownies on The Frugal Girls.com. I posted the link to share with my Facebook friends. Some pointed out that that was a lot of added coloring! My Facebook friend, Lisa, over at Retro Housewive Goes Green said "Having asthma I can't do yellow dye #5 and I seem to have issues with blue dyes. Plus they are linked to all kinds of health issues (lots are banned in other countries). She gave me a link to find natural dyes over at the Natural Candy Store. My daughter and I decided for school that we would make some. We chose to do GHOST so not to use all the food coloring. She also wanted to make pumpkins and decided to just use the white butter cream frosting on them too! *Make your favorite brownies into a 9 X 13 pan. *When cooled use your cookie cutters. Try to fit each piece in tight to not waste any brownies! We were able to get 12 cut-outs. *We made buttercream frosting. Do this while the brownies are cooling. You can also buy frosting. *Once cooled and cut out then frost and EAT! We do not like gobs of frosting so we lightly frosted ours. Your brownies turned out cute!! Thanks for linking to me. hehe And they look yummy. I LOVE brownies. I have some of the natural dyes and natural sprinkles so I should do this sometime. LOL thanks Lisa for giving me the idea of not using all the dye. We were going to add sprinkles but didn't have any holiday ones on hand. This was a spur of the moment project! Those look so wonderful! I am a sucker for brownies anyway. I might try doing the pumpkins with our kids!